Millennials are already better at managing their money than many older people give them credit for being — and in some ways more responsible than many older people, period. Many of them could even retire richer than Baby Boomers and members of Generation X. That's according to financial website Nerd Wallet, which conducted a survey of more than 2,000 U.S. adults aged 18 and older, of whom 1,112 are parents, to find out about their retirement savings habits. Of the respondents, 1,677 say they are saving for retirement. The good news: "Despite being earlier in their careers and having lower incomes … millennial parents may be out-saving parents of every other generation in terms of retirement," the survey says. And, if they keep pace with their current savings habits, they could retire with $1 million more than Baby Boomer parents and $400,000 more than Gen X parents. According to the survey, of employed parents currently contributing to retirement funds, 38 percent of millennials contribute more than 15 percent of their annual income, compared with 24 percent of Gen X and 23 percent of Boomers. Nearly half of millennials contribute around 10 percent, compared to 8 percent and 5 percent for Gen X and boomers, respectively. "Achieving that level of savings and retirement confidence doesn't come easily," the survey notes. 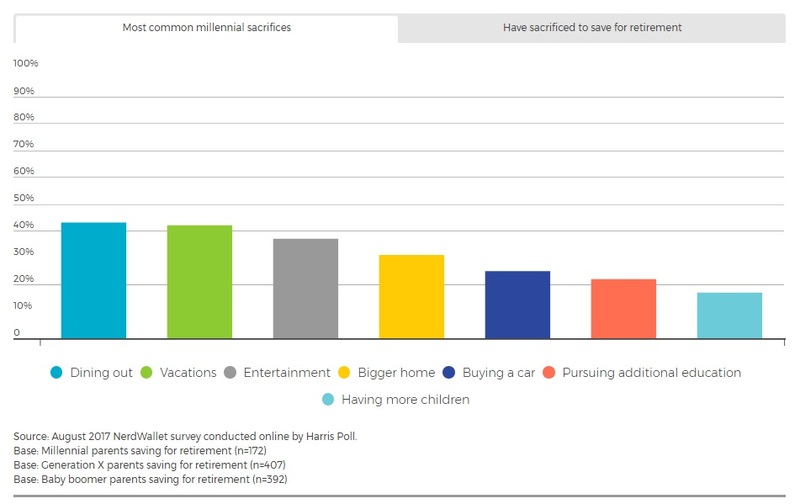 "According to the research, 76 percent of millennial parents saving for retirement report that they've made sacrifices to do so, while 69 percent of Gen X parents and 60 percent of boomer parents say the same." The top sacrifice is dining out, as 43 percent of millennials saving for retirement say they've cut back on restaurants. Another survey found that, among millennials, dining out is number one money-waster. And cutting back on a few fast casual meals may be worth it, since 61 percent of millennial parents say saving for retirement is a priority and one of their top long-term savings goals. The survey did find, though, that 7 percent of millennial parents are not saving for retirement, like 8 percent of Gen X and 18 percent of Boomers. To start saving, or to increase your savings, look for opportunities to increase your contributions, like if you get a higher-paying job or a raise, the survey says. Make a plan and create a budget, like these millennial parents who are trying to pay off $600,000 in five years. And, the survey says, "save when you can to weather periods when you can't. Much of parenting is about thinking ahead, but it comes with its fair share of curve balls. "Saving more when you have extra funds can help lessen the blow of the times when you need to cut back due to increased expenses. It also gets money invested, so even if you're not making additional contributions, those investments continue to grow in the background." For even more savings tips, check out how to save $1 million for retirement on a $50,000 salary.